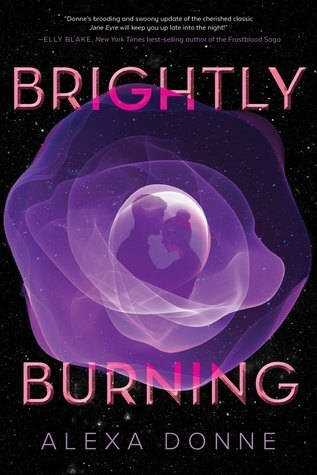 Brightly Burning by Alexa Donne is a young adult science fiction fantasy with a dash of romance that is also an imaginative retelling of the classic Jane Eyre. Of course what better way to modernize a classic than to do a take of it that is futuristic feeling in the setting with the story taking place upon a space ship. Seventeen year old Stella Ainsley was working as an engineer aboard the poorest ship of the fleet after being raised in a wealthier life with an aunt that didn’t want her so she shipped her off the first chance she could. Having an extensive education though Stella has set her sights on finding a job on another wealthier ship and continues to send out applications. When Stella actually receives a reply from the captain of the Rochester for a position as a governess she jumps at the opportunity. What she never expected upon arriving on the privately owned ship though was the luxury of not having the ration restrictions she’d always had, a huge room of her own and a very handsome nineteen year old captain. Brightly Burning was one of those books that was just a lot of fun to read. I thought the author did a wonderful job with the outer space setting along the way. The only thing really that I would have liked to see was a bit more to the romance, it felt a bit like an oh it’s a cute boy I’m in love situation. However, there really was several months passing in the story that just aren’t drawn out so it wasn’t quite as rushed as it may have felt, showing a bit more would have added an extra spark. In the end though I actually rather liked the creativity behind this one and would recommend checking it out. Alexa Donne is a Ravenclaw who wears many hats, including fan convention organizing, teen mentoring, college admissions essay consulting,YouTube-ing and podcasting. When she’s not writing science fiction andfantasy for teens, Alexa works in international television marketing. Aproud Boston University Terrier, she lives in Los Angeles with twofluffy ginger cats named after YA literature characters. Brightly Burning is her debut novel. Visit her at alexadonne.com, and on Twitter and Instagram at @alexadonne. Sorry you missed this one, I know it’s been ages since it was put on there. It was really kind of fun although I can imagine there will of course be those that complain it’s not the original. To me I always go in looking for things to be changed up and something new and this one certainly did that. Ooh a retelling of Jane Eyre in space- that does sound cool. Great review!